Publishers Weekly "information-packed... The authors do make a very persuasive case that preventive measures should be taken to eliminate or mitigate early trauma" Kirkus Reviews "A wake-up call? Absolutely." Daniel J. Siegel, MD, Executive Director, Mindsight Institute, Clinical Professor, UCLA School of Medicine, and author of Mindsight "Karr-Morse and Wiley have done it again! Scared Sick raises many profound and urgent questions about how stress during the earliest moments of our lives--in utero and out in the world--can create lasting negative impacts on the health of our bodies and minds. While many of the exact details remain to be clarified with further research, this book's summary of the science of stress creates a call to action that is quite clear: We need to awaken ourselves to the importance of both preventing toxic stress early in life and helping the many who have been affected during these early years to have the healing support that is available in the form of social connections and mindful reflective skills that can lead us in new and helpful directions in our collective lives." The first years of human life are more important than we ever realized. 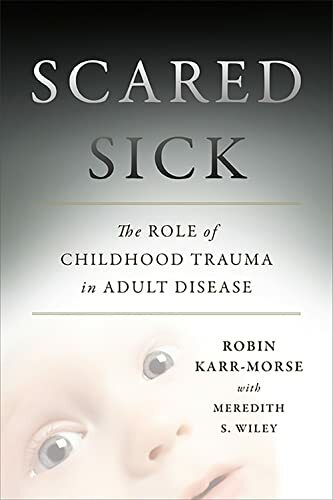 In Scared Sick , Robin Karr-Morse connects psychology, neurobiology, endocrinology, immunology, and genetics to demonstrate how chronic fear in infancy and early childhood, when we are most helpless,lies at the root of common diseases in adulthood. Compassionate and based on the latest research, Scared Sick will unveil a major public health crisis. Highlighting case studies and cutting-edge scientific findings, Karr- Morse shows how our innate fight-or-flight system can injure us if overworked in the early stages of life. Persistent stress can trigger diabetes, heart disease, obesity, depression, and addiction later on.